Greetings, Balloon Pilots! The 2019 Balloon Classic & Fireworks will be: FRIDAY, SATURDAY, SUNDAY, JULY 26, 27, & 28! Before you begin, please download and review this document: 2019 Balloon Classic & Fireworks Pilot Information. Please read the Pilot Entry Agreement on page 5 as the application will ask that you have read and agree to the terms of the agreement. THE ONLINE APPLICATION IS DUE BY APRIL 1, 2019. If you prefer a paper application packet, please contact Andrea Hartman, event manager, at andreah@cantonchamber.org or 330-458-2054. You will be informed of your acceptance by May 27, 2019. If your plans change and you are unable to attend our event after registering and receiving a confirmation of your acceptance, please notify Andrea NO LATER THAN JUNE 24, 2019. We look forward to seeing you in Canton, Ohio!! * Cell Phone Number (Used for event REMIND text messages). Verizon users MUST download the Remind app. * Crew Chief Cell Phone Number (Used for event REMIND text messages). Verizon users MUST download the Remind app. * How many PIC hours have you completed? * How many PIC hours have you completed in the past 12 months? * In the past 5 years, have you ever been convicted of a DUI/DWI? If you have been convicted of a DUI/DWI offense since holding a pilot certificate, have you filed the Notification Letter required by 61.15? * In the past 5 years, have you been in violation of an FAA Regulation? If you answered yes to either, please explain (e.g. date, brief facts, disposition). If you answered yes to either, what remedial/corrective action have you taken as a result of your incident/accident or conviction? * Please indicate whether you are a team competitor or a fiesta pilot. If you are a team competitor and have a team, please list members and indicate the team captain. Team Competitors: please provide your BFA/HACD competition card number. Are you ranked "A", "B", or "C"? Note: Only one "A" ranked pilot per team. * Would you like to participate in the Media Flight on Friday morning? Limited space is available and priority will be given to corporate and special shape balloons, and pilots living within a 50-mile radius. Yes, I am a sponsored shape or corporate balloon pilot and would like to participate in the Friday AM Media Flight. I understand a complimentary room will be provided. I am not a Media sponsored balloon pilot but, I would like to participate in the Media Flight. I understand I will be provided propane but no Thursday evening room. No, I do not wish to participate in the Friday Media Flight. Media Flight: If checked "yes" how many media passengers will you take? * Would you like to participate in the Friday evening Night Glow? Limited space available. * Do you need local crew members? Please check all that apply. No, I DO NOT need any local crew. Not sure at this time, please contact me! If checked "yes", how many crew members do you need? If you have a different request for a certain flight please list. * I agree to add the "Canton Regional Chamber of Commerce/Pro Football Hall of Fame Enshrinement Festival" as an additional insured for the purpose of my participation in the Pro Football Hall of Fame Enshrinement Festival Balloon Classic & Fireworks to be held in Canton, Ohio, July 26, 27, & 28, 2019. Every participating pilot is required to have a minimum of $1,000,000 combined single limit coverage, $100,000 minimum property damage, and $100,000 minimum passenger liability for each passenger carried. 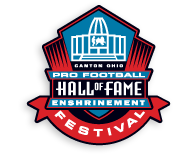 In the event of policy cancellation prior to July 26, 2019, ten (10) days written notice will be given to Canton Regional Chamber of Commerce, Pro Football Hall of Fame Enshrinement Festival, 222 Market Ave. North, Canton, Ohio 44702. * Pilot Room: All pilots receive one (1) room free for Friday and Saturday night. Extra nights will be at the pilot's expense unless other arrangements such as the Media Flight have been made. Please note the final day to cancel or reserve a room is June 10th by 5:00pm. Double 7/25-7/28Double 7/26-7/28King 7/25-7/28King 7/26-7/28I DO NOT need a hotel room. * Crew Room: (Cost $115/night) A credit card number must be provided to the Courtyard Marriott in order to reserve the room; you will be contacted soon. Double 7/25-7/28Double 7/26-7/28King 7/25-7/28King 7/26-7/28I DO NOT need a crew room. * BIO: Please list any unique or memorable experiences you've had in flight! * BIO: What other claims to fame, hobbies or interests do you have? * I have read and agreed to the terms of the Pilot Entry Agreement on page 5 in the "Balloon Classic & Fireworks Pilot Information" document. * BIO: Please list any countries you've flown in outside from the United States. * I certify the application information is current and correct to my knowledge. * Please submit a color photo of your balloon to be used for the event program and identification purposes. Please note, after submitting this form, your card will be charged.